After seven years on the market, can a Greenwich Time puff piece really help find a buyer for this house? GT's out with an "article" profiling a back country contemporary up at 66 Cherry Valley Road, currently priced at $10.888 million. 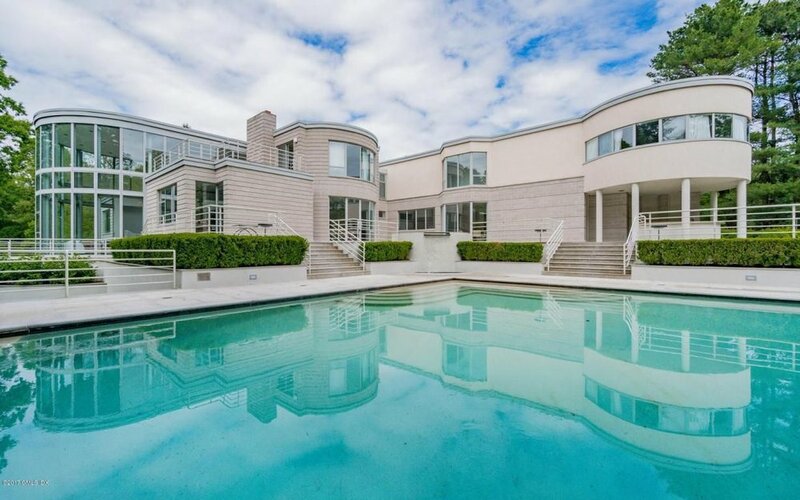 I've always felt a pang of guilt about this property because back in 2003, when it came on the market at $18 million, I wrote about it in a newspaper column that was running at the time. I scoffed at the price, and the design, and mentioned that it adjoined a pond so choked with algae that the seller should be expected to throw a lawnmower into the deal. The owner was so incensed that he called, not me, but his own listing agent, and tore his ears off for a full half-hour, or so I'm told. That poor guy, new to the business, was sufficiently traumatized that he quit the business, permanently, immediately after his client hung up. Sorry, pal. I don't know where that young man ended up, but a new agent was assigned to the property and she eventually sold it 9to her own client) in 2005 for $11.4 million. No mention in the sales report whether a lawnmower was included. In any event, those buyers have been trying to unload it since 2010, starting at $13 million and barely budging as the years crept by. Personally, I'd put more faith in a substantial price cut than a glowing article in Greenwich Time, but perhaps that's just me.